With all the research being carried out on medical marijuana, it might be useful to know the different strains of cannabis we have out there. Some people have seen different outcomes with different strains of weed due to an effect called the entourage effect, various combinations of CBD, THC and the terpenoids of cannabis varieties can contribute to different results when you are using medical marijuana. That is crucial to know since particular cannabinoids, like THC, might have severe negative side effects for most users, especially when the levels of THC are high when compared to other cannabinoids. Some conditions like seizure disorders might also get affected by any levels of THC. Knowing that there are various strains available can be useful when considering, together with the recommendations of your doctor, what will work for you if they advise that you try a specific variety. Once you decide to use cannabis for whatever reason, check its origin and where it’s grown. For instance, you can go for varieties grown by Nevada dispensary Association since they are popularly known for the growth and production of medical marijuana. Sour diesel refers to a sativa variety of marijuana, and it is a common strain. It derives its name from its unique scent which almost the same as diesel fuel, although it contains some citrusy tones probably from the terpenes which contribute to this uniqueness. Most of its medical benefits revolve around focusing and mood disorders, like anxiety and ADD/ADHD. It’s a tricky strain to use, though, because it tends to work well for these disorders in low doses. If you take a higher dose, it can typically increase paranoia, anxiety or social anxiety and have an opposite effect for which it was meant for medically. In addition to the lung damage risk caused by generally smoking cannabis, sour diesel has a strong smoke as well as a lingering taste. Most users say that it has assisted them with their arthritis symptoms, but it doesn’t generally affect the body like it affects the brain function and mood. 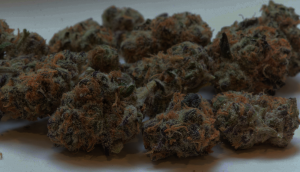 This strain is an indica variety also known for its strong smoke, which is normally spicy and may induce a cough. It has an extremely high content, at times even greater than that of the sour diesel. The Og Kush properties can give you a happy feeling in your head and calm down your body, making it relax. When it comes to medical benefits, most users say that its treats their headaches, digestive problems, depression, anxiety, ADHD/ADD, and also Alzheimer’s. This strain is a pure Sativa variety of cannabis with a sweet, pine smell. Medically, it’s often used for pain, depression, nausea, stress, and fatigue because of its uplifting effects. Some of the side effects can be dry eyes, dry mouth, paranoia, anxiousness, and dizziness. It also has a very high ratio of CBD to THC, which is the main reason for the effects of paranoia. Other people say that it also helps them to remain productive. The white window is considered as a good strain for pain management caused by many things. It can also make people more social, energetic, hungry, and even introspective. Since White Window is a hybrid strain combining Sativa from Brazil and Indica from Southern India, you can get a body high due to this hybrid effect. The Indica side of it can make you have more physical effects and less high mentally. The medical effects of this strain include physical relaxation and pain relief. Blue Dream strain has a sweet smell, more like a combination of cheese and berries. It tends to be an equal Sativa-Indica strain. The mental high tends to come from the Sativa part, with the body high coming from the Indica part. This strain is used for anxiety and stress, giving the user a complete body relaxation effect, and a mental effect that can calm someone down without paranoia and other side effects that result from cannabis use. However, the effects typically vary from the mental experience and body experience. These medical benefits of cannabis are among the numerous benefits this plant has to offer. It’s still surprising how medical cannabis is not yet legalized in many countries and still holds such a bad reputation. However, before using medical marijuana, consult a physician to know what strain will work best for you with minimal side effects. The post Top 5 Strains of Cannabis: Benefits and Risks appeared first on Smoking With Style.